Sugar is not sweet anymore. There is a saying “Nectar also becomes poisonous if consumed extremely”. Day by day Sugar is damaging the health of hundreds of people. This post is especially for people with sweet tooth. Yes, I can understand your feelings. Your desire to eat sweet stuff is natural. I know that you are a dessert lover. But today I’m here to give you a bit of advice. You might have heard about Diabetes. Ah! Who hasn’t heard of this? Sounds familiar right? That is the main concern of this post. Consuming sugar leads to many health problems and one of them is Diabetes. Today lakhs of people are suffering from either Type-1 Diabetes or Type -2 Diabetes. Now don’t stop reading further just because you don’t have diabetes. There are many red alerts that I’m going to highlight here. Why is Sugar bad for health? “Sugar is toxic.” Dr. Robert Lustig, a famous researcher & author at the University of California, San Francisco, has published a paper about Sugar toxicity after in-depth research. Do you know that Sugar makes you addictive? yes, just similar to Cocaine. There are no proteins in Sugar. It is rich in carbohydrates which makes Sugar not-recommended for people who are on diet. Your body glucose level increases after the consumption of sugar which eventually leads to Insulin Resistance. Let me brief you about Insulin resistance. Insulin is the hormone produced by Pancreas which absorbs excess sugar produced in the body. This balances the blood sugar level. If sugar consumption is way too high Pancreas will fail to produce enough Insulin which is called Insulin Resistance. Insulin resistance makes individual prediabetic and if the proper care is not taken it leads to Type 2 Diabetes. Though there are ways to control the Diabetes, it is not good for the body in the long run. 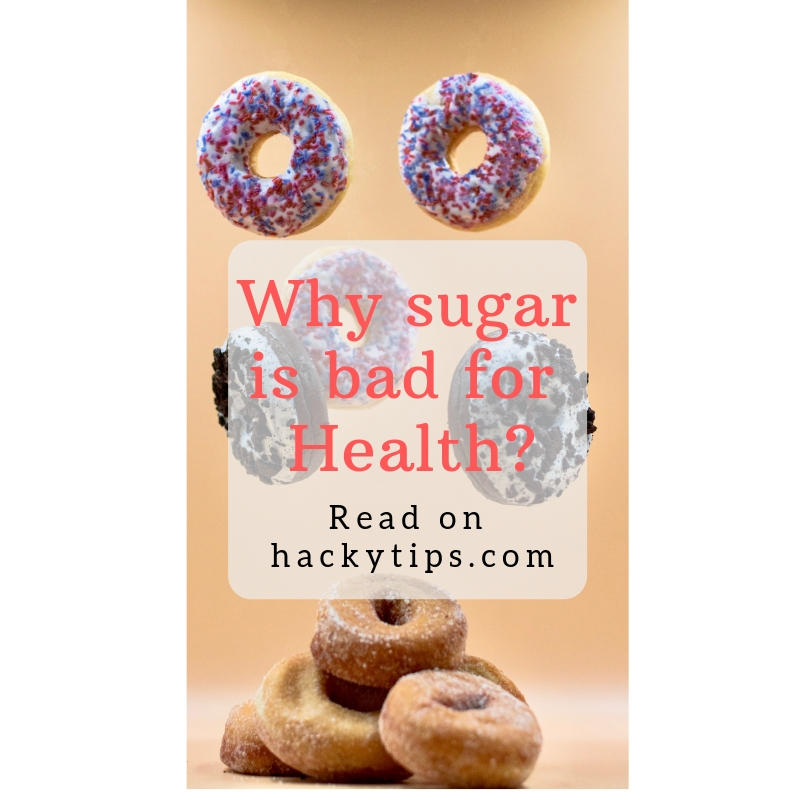 Not only Diabetes, but the high consumption of Sugar may cause Heart problems, Kidney diseases, Dental problems, Obesity, reduce natural immunity power and other severe health conditions. What happens if I eat way too much Sugar? Sugar is like slow poison. Symptoms or problems are not immediate. Your body will manage till the last minute. Once it gets complicated then it is difficult to come back. The affected body may give up completely. Hence it is very important to keep an eye on your food. It is very important to be aware of ‘how-much-to eat’, ‘What-to-eat’ & ‘When-to-eat’. Diabetes: The first risk of high sugar consumption is Diabetes, which slowly leads to all other problems. There is no cure for Diabetes. Once it comes then it is a lifelong hassle. 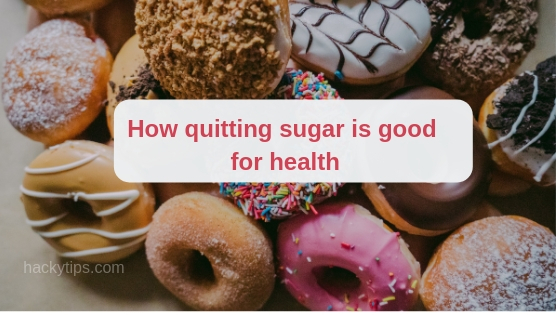 Hence diabetes is the answer to the question ‘Why you should quit Sugar?’. Heart problems: High sugar level stresses the heart muscle. A constant increase in blood sugar will increase the risk of heart attack. That means people who are not diabetic also come under the shadow of risk. Insulin Resistance: As already said, Insulin Resistance leads to diabetes. If insulin production in the body is stopped completely, one may have to take external insulin on regular basis. Obesity: Since Sugar is a rich carbohydrate, high consumption of sugar results in increased weight. Fat gets accumulated in the body causing obesity. If not monitored on time this will lead to many problems in the future. Affects the functionality of Kidneys: High sugar in the blood increases the uric acid levels. As a result, kidneys may stop working which makes one depend on Dialysis. Liver Damage: Whenever there is blood sugar level rise, the body produces insulin hormone. This signals the liver to absorb the extra glucose and store it in the form of Glycogen. Similarly, when there is a decrease in blood sugar level, the liver releases glycogen back to the body & maintains sugar level. In people who are diabetic or has insulin Resistance, Liver doesn’t recognize the insulin production and releases more glucose. This increases the blood sugar level in diabetic people even though they are fasting. This may lead to Liver disease over time. Dental Problems: Have you experienced that tingle in teeth whenever you eat any food that is heavily sweet? High consumption of sugar leads to cavity and tooth erosion. You know how many spoons of sugar you are using in your tea/coffee. Donuts are full of sugar and hence you avoid them. You have learned to say no to desserts and other sweet puddings. But still, you are consuming sugar every day. What you don’t know is the amount of sugar in food that we are consuming every day. For example, take sodas; we naturally assume that sodas are free from sugar or have less sugar content. Next time while drinking soda just check the ‘Nutrition facts’. 12 ounce of a bottle (Any regular soft drink) contains 39g of sugar! From now on develope the habit of checking ‘Nutrition facts’ on every processed food. I’m listing down a few foods that are not good when you are trying to quit sugar. Sugar consumption: Stop adding sugar to tea, coffee or to any other food. The first step in sugar-free-diet is to stop the direct sugar consumption. Soft drinks: Even though you choose diet drinks, they are not good for health. Instead of soft drinks, add fruits (strawberry, cucumber slices, grapes etc) in a fresh water bottle and keep drinking it for the whole day. Deserts: Icecreams, Puddings, cakes, cookies, Pastries, chocolates, Granola bars are full of sugar. If you skip them completely then you are reducing your sugar consumption by a high percentage. Coffee & Tea: Lattes and iced tea should be avoided. Drinking more coffee is also not good for health. If you are addicted to coffee try reducing the consumption slowly. Instead of coffee or tea, mix ACV in water and drink for better health. Ketchup, sauces & Dressings: Tomato ketchup, sauces like BBQ sauce & Spaghetti sauce, Salad dresser with high sugar content are excluded from the sugar-free-diet. Avoid Alcohol: Beer has high sugar content. It is good to avoid alcohol when you are quitting sugar. Processed foods: Pizza, Bagel, Burgers, Samosas, canned food, frozen food are the must things to avoid. All these can rapidly increase sugar content in the body. It is not easy! However, if you make your mind nothing is impossible. Having bad health will cost you physically and financially. All the lifetime earned money will be gone for the treatment in case of severe health condition. It is difficult to walk away from the Donuts. It is difficult to say no to deserts while everyone else is enjoying. If you are feeling it is impossible then don’t quit in a single shot. Start reducing the sugar consumption slowly which prepares you day by day. Add more protein to meals: You are quitting sugar! Nothing else can replace the taste of sugar! Hence make your meal more interesting by adding proteins. Love your food, try different varieties. 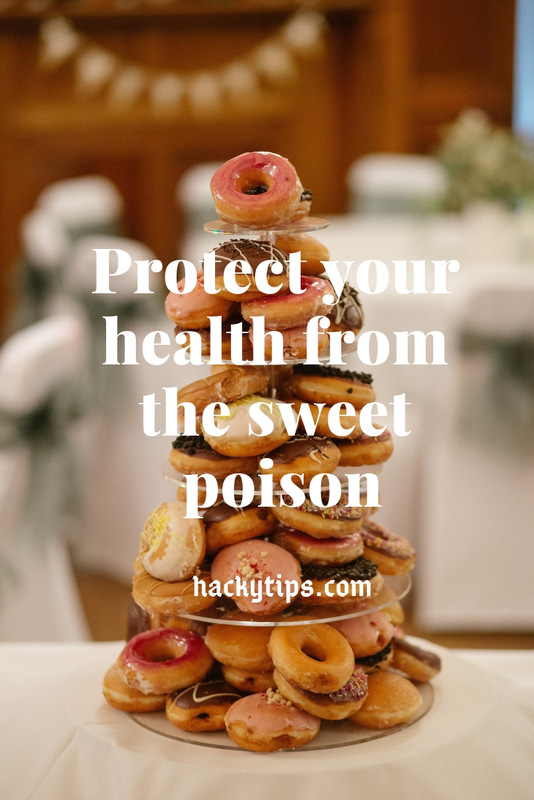 Stay away from sugary foods: It is time to break up! First of all, don’t shop any sugary products. You cannot say others not to eat sugar. Don’t be that selfish. Instead of that, you stay away from sugary foods. Distract yourself: Just ignore cravings! Distract yourself by involving yourself in something else. Go for a walk with your pet, read books, paint, lawn or something that really interests you. Eat fruits: Right now don’t worry about fructose! Eat lots of fruits as compensation to sugar. Cook your own meals: You never know what happens behind the screen. If you cook by yourself you will be aware of the ingredients. thus you can also include more proteins in your meals. Drink more water: Now you have stopped drinking soft drinks and readily available fruits juices, the body needs hydration. Drink lots of water. Add fruits, ACV, lemon, and salt to the water if you cannot drink just water. Follow regular diet: Skipping breakfast or meals will make your body crave for more food. This may cause an increase in blood sugar level. To avoid follow your diet regularly. Start your sugar detox! This will promisingly improve your health, keeps blood sugar level on track and hence make you more active in life. Go ahead and do it! Very well researched and well written article. Diabetes is a silent killer and sugar is the root cause of so many health issues. You have brought out a very relevant and critical point here. Glad you liked the post. Thanks for the reading. I’m happy to share that I have steadily reduced my sugar intake this year. There were weeks when I totally did not consume sugary foods. There also days when we did not include sugar in our grocery list. ? Very good reminder during the holidays when there are lots of sugary foods! I agree with you, that’s why I’m slowly lessening my sugar intake. Even with that small step, I could already feel the benefits such as feeling lighter, having more energy, and being more alert. Yes yes! the results are definitely worth. I couldn’t agree more. Sugar is a sweet poison. Very informative post. 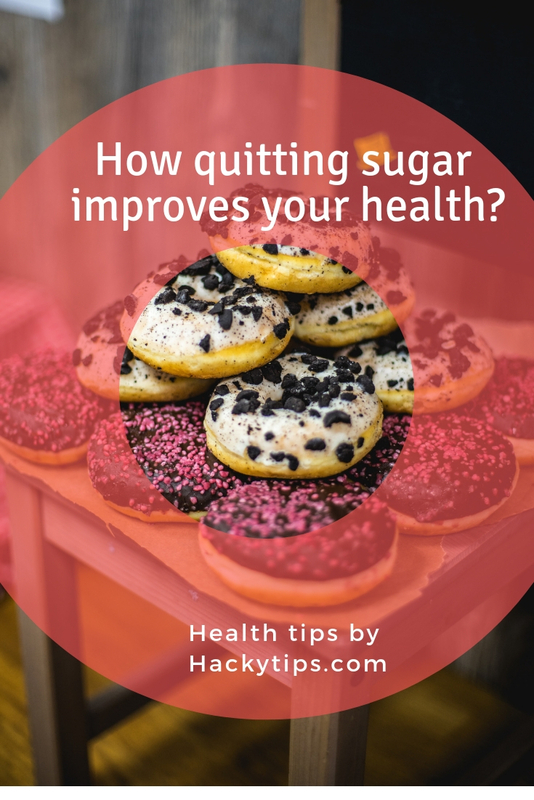 Yes, cutting out unnecessary sugar is great, but I disagree with quitting it altogether. Agree. Quitting makes it difficult especially If none has Diabetes in your family then well and good. An informative post with nice suggestion about how to get over the cravings. The real challenge with sugar is that aside from being addictive, it is in everything… almost. Curbing our sugar intake can make a huge difference… it is definitely a goal worth pursuing. Having a regular checkup is very important. I’m glad you found it helpful. Diabetes is real. Thanks for this reminder. This is such a Great Post I’m going to share it with my family. I try everyday to take less and less sugar but it’s soo hard. I always try to have fruits whenever I crave sweet during day but at night I end up having desserts ? Sugar is meant to be loved. But overeating can cause real health hazards. As long as everything is natural and non-saturated it won’t hurt. Nice Post. An abundance of added sugar may cause your liver to become resistant to insulin, an important hormone that helps turn sugar in your bloodstream into energy. This means your body isn’t able to control your blood sugar levels as well, which can lead to type 2 diabetes. Yup! Insulin is very important to control blood sugar levels. Too much of anything is simply terrible! Sugar is certainly one big example. We loved the details and efforts put in this blog. Okay, I need to read this article over and over again. I seem cannot quit sugary drinks, goodies and just about anything to satisfy my sweet tooth. Thank you so much for sharing. You are welcome! Have a wonderful year ahead. Great Read! I get the chance to learn new things! I will definitely follow this blog so I get updated for new articles! I am low-carb and had gestational once. I know how bad sugar can be for me. Great post and good work!